Samuel Adams… Some people could say he was a man who wore many hats during his lifetime. He played a major part first in resisting Britain’s Stamp Act and then in organizing the Boston Tea Party. His duties ranged from American revolutionary to one of the nation’s Founding Fathers. However, what brings us to this blog post today is to learn about how Samuel Adams views on slavery lead to one of the greatest accomplishments in America. Samuel Adams view on slavery was quite different than many of the other Founding Fathers. The Adams family, from what I uncovered, was against slavery or in better terms “strong anti-slave abolitionists.” This was a very daring stance to take, as many other Founding Fathers did not agree with the family. All together, they stood by their beliefs and did not cave to the way Americans viewed black people during this time period. Owning, using, and abusing people for labor or slavery was second nature to many people and was not looked at in a negative way. Therefore, the way that the Adams’ stood up for their belief was awe-inspiring to me. I want to take a moment to discuss the bolded quote on top of this post- it was said by Samuel Adams himself. He was a strong believer in his anti slavery morals. It was his belief that every man (black or white) should be free from any higher powers on earth that were keeping them from being treated like human beings. If the white people of this time period continued to take the liberties away from black people, they were not being morally correct. By taking the rights from slaves they were following their immoral thoughts. Every person deserves to be treated with respect and dignity. No man is superior than the other therefore, no person should be locked down by an owner. Everyone should absolutely be seen as equals. The quote, seen above, allows for one to realize Samuel Adams’ morals are much different then other founding fathers. Now, if that quote is not enough to make you believe that Samuel Adams had a strong disagreement with slavery- let’s take a look at a different scenario involving Samuel Adams and an enslaved individual. After his marriage to Elizabeth Wells in 1764 the couple received a black worker named Surry as a wedding gift. He was not going to allow Surry to stay in their home because he did not believe in owning slaves. Instead, Adams freed Surry and allowed her to stay with the family. She was considered a hand in the house and extended family to all those who knew her. 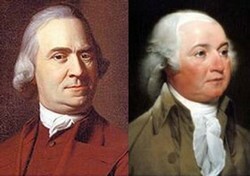 Finally, by 1782, the Massachusetts Supreme court agreed with Samuel Adams and ruled slavery as unconstitutional. Following this decision, all slaveswere freed immediately leaving Massachusetts as a free state. 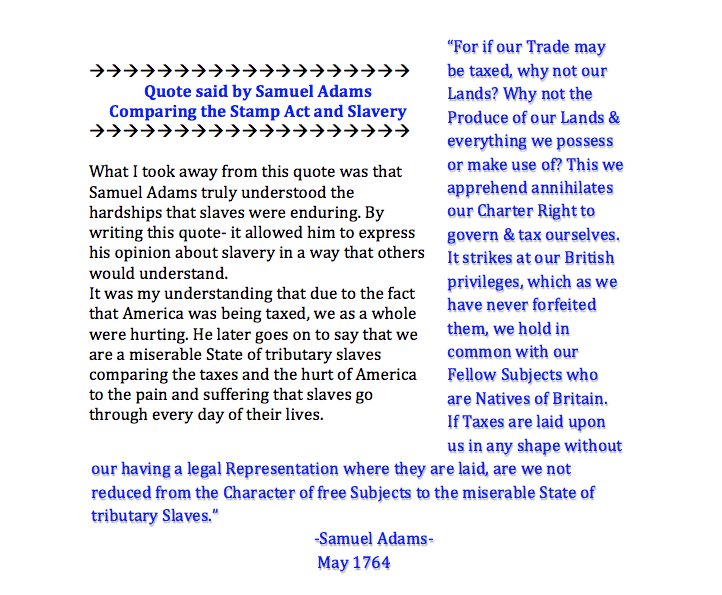 With this in mind I would like to leave you all with a picture Samuel Adams himself…. There is so much truth in this picture…. 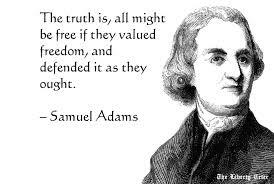 If everyone valued the rights of freedom as much as Samuel Adams they, themselves, would be free as well. However, because they chose to be involved with taking the rights away from slaves and not allowing the slaves to be free the owners are not free. I’m proud that Samuel Adams and his family were part of the accomplishments of abolishing slavery. By standing their ground and seeing the equal rights in all people they were able to start a change in the American ways of this time period. I am even happier knowing that the horrific times of slavery that once were are no longer.